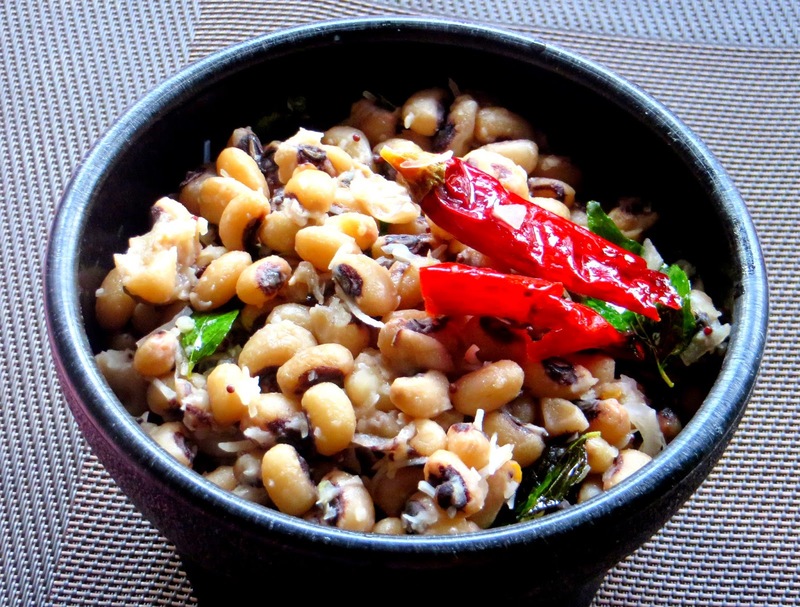 Today's sundal recipe is Black eye bean sundal. Black eye bean (karamani) is loaded with nutrients. A great after school snack for a protein boost. Here's the recipe. The next day, drain water and pressure cook with just enough water and add salt. Cook for just 2 to 3 whistles. Alternatively, boil the beans in water until its cooked. Heat oil in a kadai. Temper the mustard seeds. Add curry leaves and dry red chillies. Add the black eye beans. To it add asafoetida. Sprinkle salt as the beans is already cooked in salted water. Mix the desiccated coconut or fresh grated coconut and give a quick stir and turn off heat.